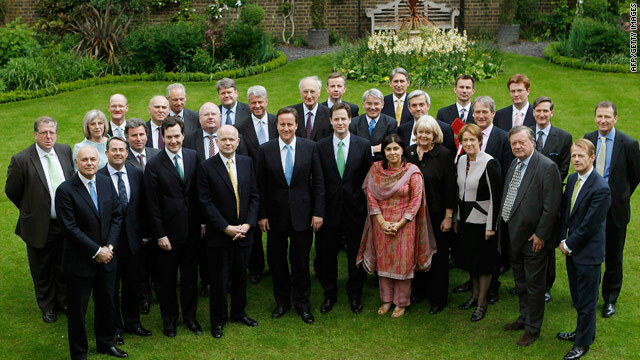 Britain's new Cabinet features members of the once-rival Conservative and Liberal Democrat parties. London, England (CNN) -- Britain's new Cabinet held its first meeting Thursday and promptly agreed to a five-percent pay cut for all new ministers, Downing Street said. Tackling the country's debt crisis is a top priority for new Prime Minister David Cameron, who took office Wednesday. The decision means all members of the new Cabinet -- including Cameron -- will be paid five-percent less than their predecessors in the government of Gordon Brown, Downing Street said. The reduction in Cabinet minister salaries alone will save taxpayers about £50,000 ($73,800) this year, Downing Street said. The Cabinet also agreed to a ministerial pay freeze for the lifetime of the current Parliament, which is not scheduled to have elections again for another five years. The salary cuts and pay freeze will save approximately £3 million ($4.4 million) over the life of the Parliament, Downing Street said. Every member of Parliament receives a basic annual salary of £65,737 ($97,105). Those who are members of the Cabinet receive an additional salary on top of that, with the amount depending on their position. The additional salary can range from about £69,000 to about £134,500 ($101,500 to $198,000). For Cameron, the pay cut means he will earn £142,500 ($210,000) in his role as prime minister, compared to the £150,000 ($220,000) earned by Brown, his office said. That's on top of the salary he receives as a member of Parliament, representing the constituency of Witney, about 65 miles northwest of London.